Country Life Vitamins Menopause Support is a product destined to support the hormonal changes happening in a woman’s body as she goes through menopause. A combination of vitamins, minerals, and herbal extracts can be found in this menopause supplement, each with its own role in combating the symptoms often experienced by women throughout the onset of menopause. The quality and selection of ingredients being particularly important for such products, we decided to take a closer look at what Country Life Vitamins Menopause Support offers, so we can help you make an informed decision. What Does Country Life Vitamins Menopause Support Contain? We are glad to see that this menopause supplement contains many of the traditionally used herbal extract for addressing issues women experience during menopause. Black cohosh, for instance, is a great ally against hot flashes, and red clover also helps fighting night sweating and insomnia. It is good to have calcium, magnesium and vitamins readily available, as overall health must be promoted in order to relieve the symptoms of menopause. The recommended dosage for Country Life Vitamins Menopause Support is two tablets daily. 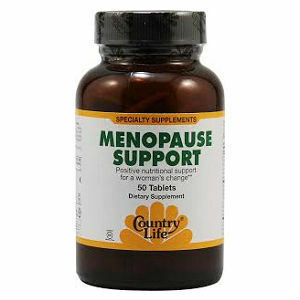 The listing price for one bottle of Country Life Vitamins Menopause Support with 50 tablets is 16.99USD. Since this menopause supplement is sold through third parties, refund and returns may have to be addressed through resellers. Country Life Vitamins Menopause Support looks like a good reliable product. Decently priced, it contains important vitamins, minerals and herbal remedies for soothing the side effects of menopause. However, there may still be other products on the market that offer more efficient extracts in the same package, so it is a good recommendation to first see some alternatives. Jackie Horowitz	reviewed Country Life Vitamins	on July 20th	 and gave it a rating of 3.